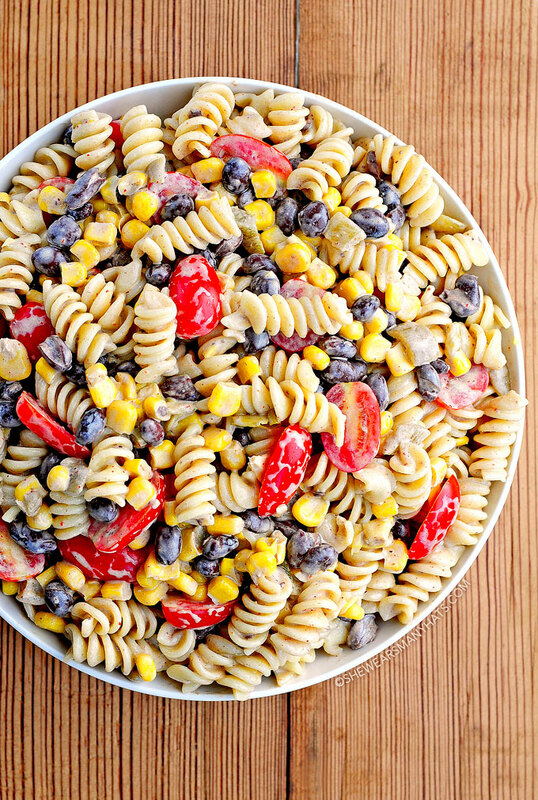 Try this flavor packed easy Southwestern Black Bean Pasta Salad Recipe at your next cookout. 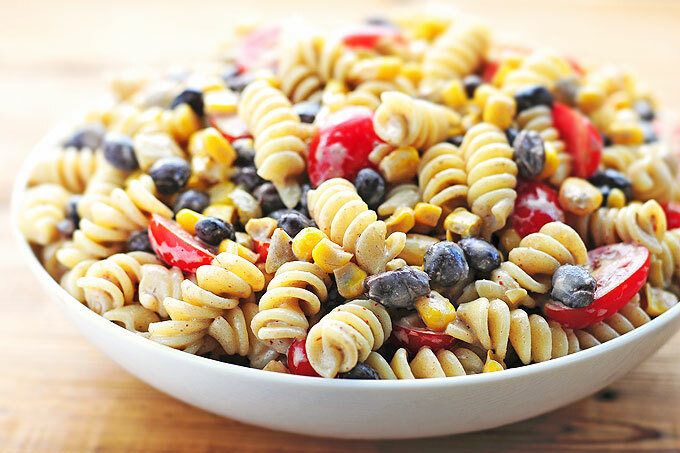 This pasta salad is the perfect side dish or a great meatless option for any meal. And it couldn’t be easier to make! Pasta Salad was one of the first things I ever learned how to cook. I think the main reason that I attempted pasta salad so early on is because it is super easy. Add your favorite vegetables, fruits, seasonings , as well as meats (if desired) to cooked pasta, toss it all together, chill for a while and voila! You have the perfect side or main dish for any menu all year-round. Since it can be made ahead and chilled, a tasty Pasta Salad is great for entertaining, plus I think it gets even better when it’s all left to mingle for a while. Pasta Salad is still as easy as I remember, plus, now there are so many inspiring flavor combinations out there to try, like this flavor packed Southwestern Black Bean Pasta Salad recipe. It’s a terrific pasta salad to use for either a side or a main entree. It has all the pieces and parts for a hearty, satisfying dish with a bunch of flavor. It’s a great meatless option too. Make a large batch early in the week and enjoy it all week long. And because this pasta salad recipe is easy to make and easy to pack to take along, it’s at the top of my list for for a picnic or outing menu. It’s certainly a picnic and cookout worthy dish, that’s for sure. 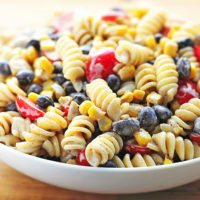 This tasty meatless pasta salad made with black beans, tomatoes, corn, chilis is great for any menu spread. Cook pasta according to package instructions. Drain; set aside. In a large bowl, whisk together mayonnaise, lime juice, chili powder, cumin and salt. Add cooked pasta and remaining ingredients; toss to combine and coat pasta. Originally published May 28, 2014. I just made a southwest pasta salad for dinner tonight! It was different than yours in a couple of ways, but same idea! Southwestern flavors are one of my absolute favorites, along with pasta salad, so of course the two make a great combination! Yours looks super flavorful! I love this so hard. Such a nice recipe for summer! Love this!!! Great for summer lunches! Such a great pasta salad! Perfect for summer gatherings! Could you substitute greek yogurt for the mayo, or would it totally change the flavor &/or texture? It would change the flavor, but I think it would be good. You may need to adjust the other seasonings to taste. Let me know how it goes! Just made this with 3/4 C greek yogurt and 1/4 C olive oil mayo. I love the taste and freshness of yogurt, but mayo does add a certain texture that yogurt can’t. Turned out awesome! I would for sure recommend greek yogurt! 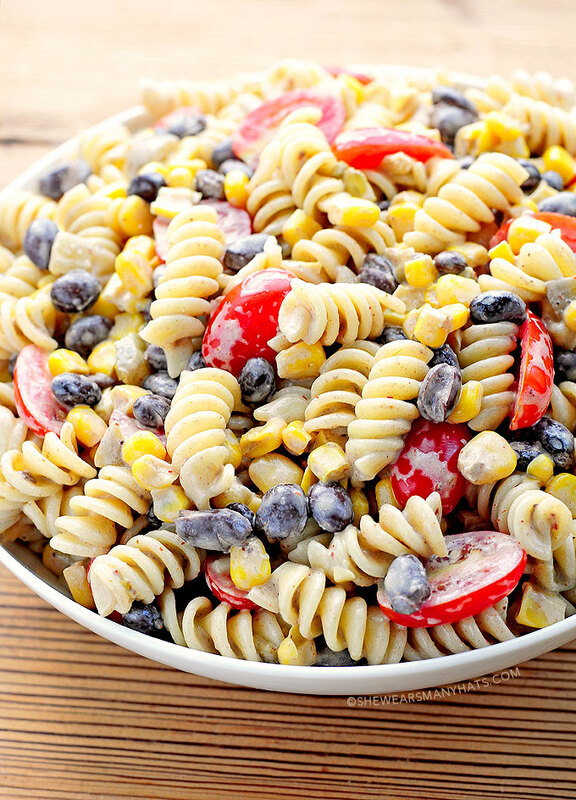 This pasta salad looks so flavorful! Wonderful recipe! I love Southwestern flavors and who doesn’t love pasta?! This is definitely going on my summer recipe list! Not a fan of mayo, but the rest of this sounds delicious! I wonder if I could sub with sour cream instead? I think that would be a great substitute! How many servings is this? Looking to do this for a campout potluck. Need this as a side for about 40 people. It serves about 10. You could stretch it a bit if serving with a lot of other sides. Is 8oz of pasta a typo? I would think you’d need a full box to have the ratios be right, and doesn’t seem like half a box would feed 10. I’m getting ready to make this later and just need to know if I need to double everything else if using a full box. Thank! 8 ounces of uncooked pasta, then cooked and drained is the correct amount for this dish. I will clarify that in the ingredient listing to avoid any confusion in the future. 8 ounces is confusing. A regular bag of rotini pasta from the grocery store is 16 ounces uncooked, and it serves 8 once cooked. How can half the bag (8oz) serve 10? With the addition of the corn, beans, and tomatoes, along with the pasta, this recipe makes 10 servings. I just posted a link to this recipe in a post about black beans on my blog. Can you substitute for a different kind of pasta that you have on hand? This sounds tasty! I think I’d like to try canned chipotles in adobo sauce instead of the green chiles. Would you recommend adjusting any of the other ingredients to accommodate these flavors? I did not care for this. Too much chili powder does not make up for blandness. There is something missing but I can’t put my finger on it. This wasn’t the best pasta salad! I think two tablespoons of lime juice was too much as it made the sauce pretty thin and it didn’t have much kick. I ended up adding quite a bit of Sriracha. It’s a good base recipe that could probably be made amazing by adding some more spices and veggies. I haven’t tried this yet but it seems very similar to the corn and black bean salsa dip that I make except that it has chopped red onions and chopped green onions. I was thinking about adding these to the salad. What do you think? Those would be great additions, Judy! Not bad. I feel like it would be better with some kind of meat like shrimp or chicken and maybe rotini wasn’t the best pasta for it. It seemed like it was missing something so I added some green onion because I had some that were about to go bad and I added more salt. Still missing something but still pretty good.